It has been my absolute fav for many many years. I have probably used up 8 bottles already. It was introduced to Hong Kong from the Biore Japan line maybe 3 years ago? Its selling point is that it can be used even on wet faces, and would not weaken its cleaning power, meaning its perfect for lazy people like me to be able to do the cleaning one step during shower. Saw this when I strolled around walmart. It is new perhaps? Rarely see any makeup remover lotion, the teal colored bottle grasped my attention right away. - cleaning power is not as good as Biore, but still better then a lot of eye remover oil I have tried. thanks for sharing! i'm always on the hunt for the best cleanser to remove make up. Now I really wanna try the Biore cleansing oil u mentioned.. but i dont know when's the next time i'm visiting hk! I generally don't like cleansing oil though :S as much as it does a great job cleansing, the oily feeling makes me feel greasy, maybe I'm not using it right (?) Anyway, great post! @edwina: I know what ur talking about! 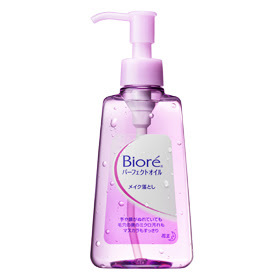 i hate the oily feeling with cleaning oil too but this biore one does NOT give you that greasy feeling at! Its more like a heavy-duty face wash (if that makes any sense). Anyway thanks for always stopping by :D! OMG a Neutrogena eye makeup remover lotion!! That's amazing, thanks for showing this! @Rainy Days and Lattes: Thanks for the headsup! I just check their websites but they dont carry it :( and haha I used it for washing my brushes before too. everything comes out lol! White french nails. Easy and Classy. Sweet Blog Award + 60 Followers Mini Giveaway!